Rising rivers and historic flooding are hampering the state and Duke Energy from fully assessing the extent of the damage to coal ash landfills and basins in eastern North Carolina, but there are reports of breaches at the Sutton plant in Wilmington and flooding at HF Lee in Goldsboro. 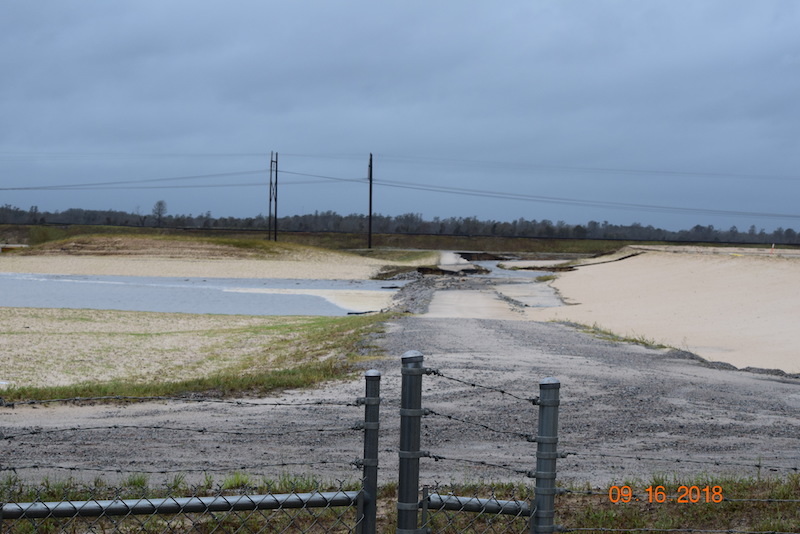 Duke Energy spokeswoman Erin Culbert said that area is a designated spot between landfill cells where rain flowing on the top is released and discharged into a sediment basin. She added that the storm water from this area has not come into contact with coal ash. It’s still unclear if the ash has reached Sutton Lake or the Cape Fear River. 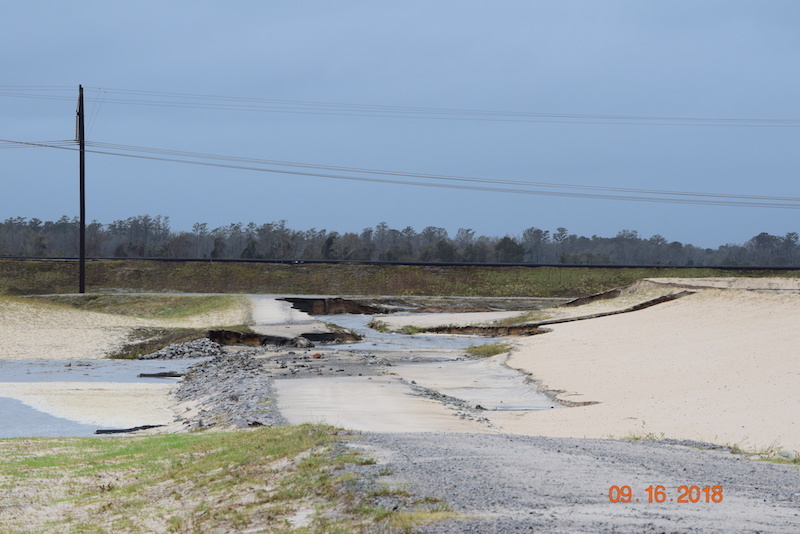 “We’ll be able to do a more thorough evaluation once flooding subsides,” Culbert said, and the utility “will make the needed repairs once the storm passes and conditions are safe to do,” Culbert said. Another view of a breach at the Sutton plant in WIlmington. State environmental officials are also sending inspectors to the site once it is safe. Riverkeepers are also monitoring the area, both in boats and from the air. Wilmington has received 2 feet of rain over the past five days; the city is largely cut off from the rest of the state by flooding. In Goldsboro, where the Neuse River is expected to crest at near-historic levels, the active ash basin at HF Lee “is performing well,” Culbert said, but the three inactive ash basins have had flooding. They are low-lying basins in a wooded area, and likewise took on water during Hurricane Matthew. During that 2016 storm, the Neuse River topped out at 29.7 feet, a record. Current forecasts from the National Weather Service predict it will crest at 27.1 feet by Tuesday. “Past similar experience in Hurricane Matthew shows only a small amount of ash would be displaced with no measurable environmental effect,” Culbert said. However, after Matthew, old stormwater containing ash entered with the river. Subsequent Duke sampling showed that levels of copper were elevated above water quality standard of 2.7 parts per billion. There were small increases in arsenic levels, but below drinking water standards. Also during Hurricane Matthew, the inactive basins released coal ash — state regulators estimated the amount would fill the bed of a pickup truck — and cenospheres. Duke and DEQ both maintained that cenospheres, hollow balls of silicone and aluminum, are inert. However, these hollow balls can also contain arsenic and other heavy metals that are also present in fly ash. Afterward, DEQ required Duke to submit a plan of action, including additional sampling and removal of the cenospheres from nearby wetlands. HF Lee is also on the list of plants where the ash basins will be excavated and the material placed in lined landfills.